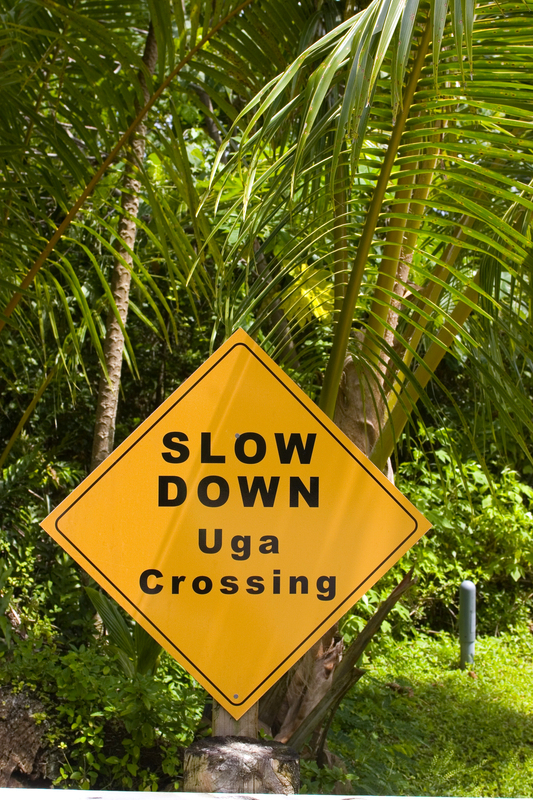 RULE NINE: Ugas have the right of way when crossing the road. In order for this rule to make sense you have to know that an uga (pronounced unga) is an ugly, plum-colored, beady-eyed jungle beast also known as a coconut crab. Their main purpose on Niue seems to be in terrifying tourists by oh-so-slowly crossing the road in front of you while double-daring you to hurry them along. Which is why although there are no pedestrian crossing signs on the island (as well as no traffic lights) there are lots of “SLOW DOWN Uga Crossing” reminders. 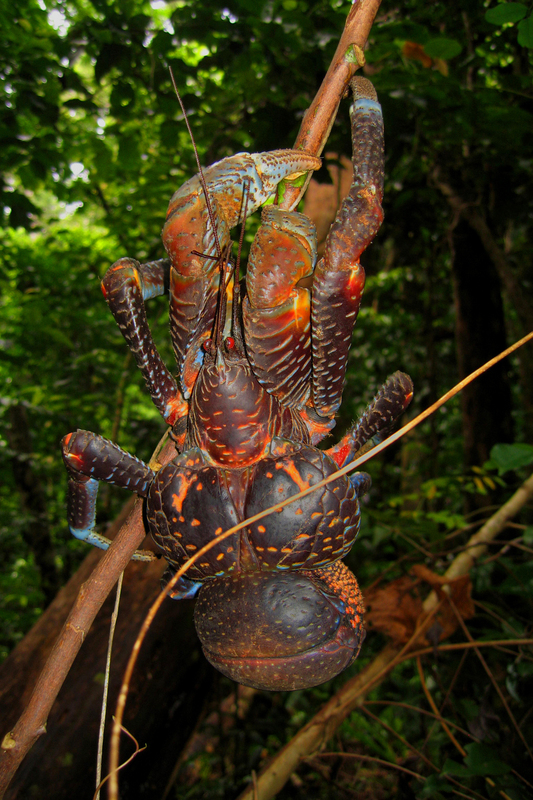 Do you know why they are called coconut crabs? Because that’s what they like to eat. Now if you’ve ever messed with a raw coconut, you know that you generally need something like a sledge hammer to open one. But an uga can do it no problem with its beefly little claw (and I do mean beefy; they grow up to 8 pounds). Think about it and you’ll realize why someone like me might be terrified to come across one of these nasty looking buggers (like this one I found crawling up a tree just outside my room) which are born in the sea but love to romp on cliffs and in the jungle looking for a delicious little coconut to snack on. They say ugas love fingers, which they think resemble coconut meat already cracked and ready to be eaten. They also say that the only way to make an uga open his claw is to get a sharp stick and ram it in his bum. Fortunately, I’ve yet to have to test this theory. And since we’re talking about coconuts (sort of), I have to tell you this: The name Niue translates as “Behold! The coconut!” I’m not even kidding. You could look it up.